Primarily, food is nature’s way of keeping us going. However, beyond eating and in the quest to have fun, humans began to search for other things food could be used for. The answer came in the form of food eating contest which is where Joey Chestnut comes in. One man who has made a name for himself in the unique niche of binge eating is Joey Chestnut. He is the record holder of many food eating contests. Who is Joey Chestnut? How did he find himself in competitive food contests? To learn more about the world greatest food eater, read below. When Joey was born to his parents on November 25th, 1983, we bet they did not envisage he would grow up to be known as a massive food eater. The world champion was born in Vallejo, California; and although his parents were together at the time of his birth, they were separated when he was 2 years of age. Joey was left to be raised by his mother. The separation of Joey’s parents may have led to his unbelievable appetite for food. After getting entrusted with the sole responsibility of raising her son, Joey’s mom took up a job at a restaurant. With her small income, she raised Joey, paying for his education from middle school to high school and eventually, he got an admission into San Jose State University. Joey credits his mother’s cooking for the large appetite he has for food. His training routine for competitions includes a milk, protein and water diet which he uses to stretch his stomach. He took this appetite into the competitive world for the first time in 2005 when he entered the deep-fried asparagus Championship while he was still in San Jose State University. His competitive career took off after he beat highly ranked competitor, Rich LeFevre, announcing himself by consuming an impressive 6.3 pounds of asparagus in 11.5 minutes. As a holder of many records and winner of multiple competitions, Joey Chestnut has made a lot of money from competition wins and his success has attracted endorsements and sponsorship from food-related brands. With all of this revenue, Joey has been able to build a net worth of $900,000. Although Joey proposed to his long-term girlfriend, Neslie Ricasa, in 2014 and the lady said yes, the couple were unable to make it to the altar. They broke up in 2015. Joey is currently believed to be single. Not a lot is known about Joey Chestnut’s family. He was raised alone by his mother after his father left when he was just a 2-year-old. There are no records of him having siblings. Joey Chestnut is certainly one of the greatest food bingers in the world. He has an impressive number of world records, with 11 from food. He fully announced his arrival on the food eating contest stage with his win over Rich LeFevre. His breakout year wasn’t just going to be winning against LeFevre, Joey took it further by entering the Nathan’s Famous Fourth of July International Hot Dog Eating Contest. In his first attempt, he took the third spot. In October of 2005, he set the first of what would later be a lot of world records at the World Grilled Cheese Eating Championship circuit by eating 32.5 grilled cheese sandwiches in 10 minutes. He quickly rose to become the rival of Takeru Kobayashi who had been the hot dog eating champion for a while. 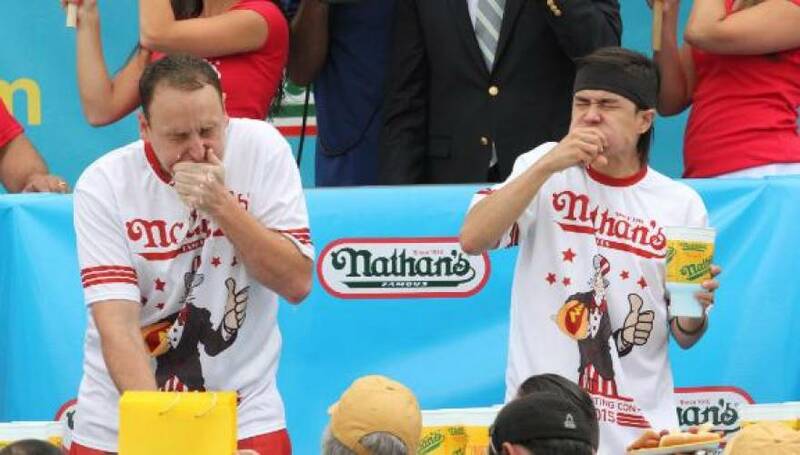 However, despite a good try, pushing Kobayashi to a new world record, Joey was unable to beat the reigning champion, losing to him both in the hot dog competition and the bratwurst contest. In 2007, Joey finally defeated Kobayashi. After a year that has started with wins in the Wing Bowl XV where he won by setting a record of 182 chicken wings in 30 minutes, he took his new challenge to his rival, Kobayashi. After a long battle of downing hot dogs, Chestnut narrowly handed Kobayashi his first loss in six years with 66-63 hot dogs. He rounded up the 2007 food competition season with a new world record at the World Hamburger Championship in Tennessee by eating 103 Krystal burgers in 8 minutes. Joey continued to win several competitions and established himself as the dominant name in the sport. He graduated from San Jose in 2012 and became a construction engineer. Joey is still a competitive eater and he’s competed every year since he graduated from college. His recent wins include a new hot dog world record in 2018 with 74 hot dogs at the Nathan’s Hot Dog Contest. He currently holds 42 records in food-eating competitions and they include munching 141 hard-boiled eggs in eight minutes, eating 7.61 pounds of chicken wings in just 12 minutes (same time he consumed 9.8 pounds of ribs), among others.